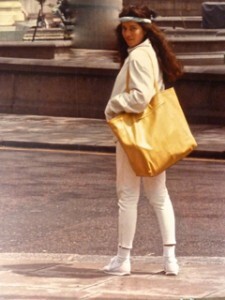 White leather and Spring in London 1984. Big yellow leather shopping bag, narrow and skinny leather jeans and leather jacket. Best stuff to travel with, count on looking great no matter where you go, or what shoes you pair it with. Lots of fun memories. You can still “get it”, custom made at Leather Waves!